. : Optics & Photonics Focus :: Hide and Seek :. Spot the cuttlefishes. The cuttlefish in the image (Sepia officinalis) show two distinct body patterns: non-camouflaged (top) and camouflaged (bottom). Can you spot them both? Photo by Roger T. Hanlon. I’ll find its tentacles on the seabed. These might well be the thoughts of a natural predator of cuttlefish. In fact, despite their lack of color vision, cuttlefish can blend into the seabed and take on any pattern or color. Looking for them, therefore, is no easy job — even for a predator with the natural advantage of keen color perception. The stakes are high as a game of hide and seek for survival begins! 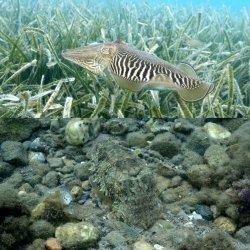 To fully investigate the effectiveness of the camouflage, an international group of researchers has developed a technique to process images of camouflaged cuttlefish, as if looking at the situation through the eyes of a predator. A cuttlefish’s camouflage works remarkably well when seen through the human eye, but how can we be sure that it is just as effective against its natural predators? Most animals see the world in a different way from us: for example, bees can see ultraviolet radiation, mantis shrimps detect the polarization of light, and many snakes identify their prey through thermal radiation alone. In order to fool the eyes of their predators, cuttlefish have developed the ability to blend into their environment, dynamically adjusting colors, contrast, and even patterns. Their "color-changing abilities have been appreciated since Aristotle’s time," points out Chuan-Chin Chiao, one of the researchers involved in this work, from the National Tsing Hua University (Hsinchu, Taiwan). Cuttlefish are indeed nature’s true camouflage artists! "Our findings provide strong support that cuttlefish are capable of hiding in plain sight of their visual predators," says Chiao. The team of researchers came to this conclusion by analyzing hyperspectral images of cuttlefish camouflaged on a variety of natural backgrounds. While images in our brain are formed using only three different color bands (red, green and blue), hyperspectral images are formed by recording the same scene in hundreds of different color bands in a broad region of the electromagnetic spectrum. The viewpoint of a selected predator can therefore be reconstructed by combining the appropriate color bands from the hyperspectral image. And this is exactly what Chiao and colleagues did: in this way, the researchers were able to fully reconstruct the predator’s visual system and quantify the actual effectiveness of the cuttlefish’s camouflage. According to Chiao, this research not only "indicates the strong potential of hyperspectral imaging technology to evaluate camouflage body patterns simultaneously," but it also "provides supporting evidence that cuttlefish can produce color-coordinated camouflage on natural backgrounds despite lacking color vision, and that the color aspect of cuttlefish camouflage is highly effective against fish predators." And he adds: "To our knowledge, this is the first time that color matching in camouflaged animals is visualized more realistically through the eyes of their potential predators." "Camouflage is of course inherently interesting to us," comments Thomas Cronin at the University of Maryland, USA. According to Cronin, in fact, studying this is important for improving our general understanding of ecological interactions, such as predator-prey interactions, and of sensory functions, such as that of visual optimization. "This is the first study to apply simple statistical treatments based on actual visual systems of potential predators to evaluate the effectiveness of camouflage pattern and color simultaneously." Finally, this research, he concludes, is of special interest for applications where it is required to find or hide critical objects in complex backgrounds, such as in spotting or concealing camouflaged objects in security situations or military operations. Chuan-Chin Chiao, J. Kenneth Wickiser, Justine J. Allen, Brock Genter & Roger T. Hanlon, Hyperspectral imaging of cuttlefish camouflage indicates good color match in the eyes of fish predators, PNAS (2011) 108, 9148–9153 (link).